Want to know why people are still buying fax machines in this age of email and paperless communication? Well here is a statistic that may surprise you: There are over one hundred million fax devices in use today! Wondering why? Here are 5 good reasons that you want to own a fax machine. 1. Security: No one can intercept your fax on the way to its intended recipient. The biggest advantage of fax over email is that you can feel safe sending private and confidential information, with the knowledge that it will be seen only by the people you want it to be. 2. Signatures: Avoid expensive mailing costs with a simple fax machine. Many agencies, banks or law firms will require a hand-written signature on a legal document. For most, a scanned copy won’t do, but a faxed copy of a signature is acceptable, so you can avoid the time delays and the costs of snail mail. 3. Simplicity: The fax is easy to use. For those not young enough to be born with intuitive computer knowledge, the fax machine is simple to use with no training at all – almost like making a call. 4. Size: There is no limit to how much you can send by fax. Send as many documents as you need with no cap on attachment sizes. 5. 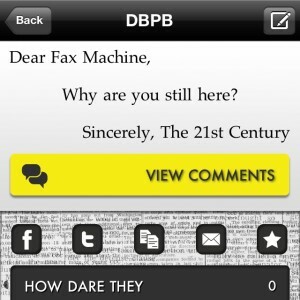 Steadfast: When your internet goes down, your fax machine won’t. A fax machine uses only a basic phone line, so you can rely on your fax machine to be working when you need it to be. So don’t throw away your fax machine yet. There are still good reasons for you to use it, and nothing will be able to replace it – not even email.